'S e sgrìobhadair Frangach a bha ann an Victor-Marie Hugo. Sgrìobh e bàrdachd agus nobhailean anns an stoidhle romansach. Rugadh e san 26mh, am Faoilteach 1802 ann am Besançon. Bha e a’ fuireach an cuid as motha den bheatha aige anns an Fhraing, ach na bliadhnaichean nuair a chuir Napoleon III Hugo air fògradh. Mar sin dheth bha Hugo ann an Jersey (eadar 1852 is 1855) agus ann an Guernsey, (eadar 1855 is 1870). 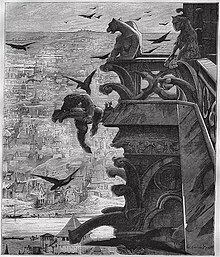 B’ e Notre-Dame de Paris (Beurla: The Hunchback of Notre Dame) a chiad nobhail a sgrìobh e. Chaidh an leabhar a fhoillseachadh ann an 1831 agus agus an uair sin air eadar-theangachadh ann an mòran cànain Eòrpach eile. Tha an leabhar cliùiteach gus an latha an-diugh. 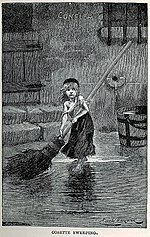 Ri measg Ùr-sgeulachdan eile, ‘s e Les Misérables aon de na leabhraichean as ainmeile. Chuir Hugo 17 bliadhnaichean seachad airson an nobhail seo a sgrìobhadh, chaidh a fhoillseachadh ann an 1862. Nuair a bha e ann an Guernsey sgrìobh e nobhailean eile, m.e. : Les Travailleurs de la Mer (Beurla: Toilers of the Sea), (1866) agus L'Homme Qui Rit (Beurla: The Man Who Laughs), (1869). Chaochail e san 22mh, an Cèitean, 1885 ann am Paris. 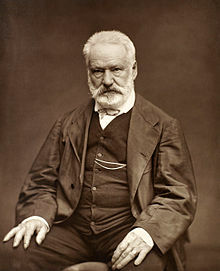 Air a tharraing à "https://gd.wikipedia.org/w/index.php?title=Victor_Hugo&oldid=542262"
Chaidh an duilleag seo a dheasachadh 22 dhen Chèitean 2018 aig 06:54 turas mu dheireadh.